Skies of Arcadia is a Dreamcast game in the RPG genre. The game was published by Sega and developed by Overworks. The game has an ESRB Rating of T (Teen 13+) and was released on 2000-11-13. The game's official site can be found at www.sega.com. 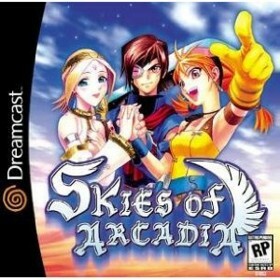 Skies of Arcadia was by far one of the best role-playing games released during the Dreamcast's short life. In the game you play the role of a sky pirate named Vyse, his best friend Aika, and a very mysterious woman named Fina. Vyse and Aika actually rescue Fina during one of their escapades aboard a Valuan (i.e. the “evil” empire) ship and much of the story revolves around unraveling the mystery behind just who exactly this Fina person really is. In addition to exploration and discovery you must also fend off advances from the Valuan empire and battle numerous interesting monsters and beasties. The gameplay is mixed between standard ground-based rpg exploration and combat and sky based battles between pirate ships. The various dungeons are littered with thought-provoking puzzles and the ship battles require a lot of strategy in order to be victorious. One of the great things about this game is the ability to customize your ship with upgrades such as better cannons. Also, Fina has a mysterious pet that transforms over the course of the game. The game itself is not very linear – which is a good thing. You are free to explore the many floating islands in search of adventure. The graphics, while not as polished as some of the other Dreamcast RPG's (most notably Grandia 2), are very well done and really give the sense of being in this world. The characters themselves also have a very wide range of facial animations which was a new thing at the time, and made them that much more believable. Overall, this game is a wonderful mix of standard RPG gameplay and turn-based ship battles that will last you several dozen hours. If you own a Dreamcast, you owe it to yourself to get this game – as it was one of the system's finest.